Successfully Added MP4 Player Watch (4GB Waterproof Steel Edition) to your Shopping Cart. This waterproof MP4 watch does it all! The MP4 Player Watch with 4GB internal memory plays incredible sounding video and audio, is a digital photo frame with background music play, handles ebooks and even has a voice recorder for memos! This is a perfect example Moore's Law where as technology advances, electronic products get smaller, do more, and are made with better quality. At its core, this MP4 Player Watch effortlessly handles audio and video. The sound output alone will leave you breathless with joy! Better sounding than the iPod hands down! And with 4GB of internal memory, you can load all your favorite movies, shows, and MP3 music into your new watch and start enjoying life to the fullest! I'd like to be under the sea, in an octopus' garden in the shade...we can't help feeling that if the Beatles were still around today they'd love this MP4 Player Watch and how it's waterproof down to 30 meters. Perfect for watching Finding Nemo while you're scuba diving. And while you're relaxing, look at photos or read a book! (Unlike your fellow beachcombers who are still stuck in the 19th century reading paper books, you can load all your favorite text eBooks into this watch and have a complete library on your wrist anytime! 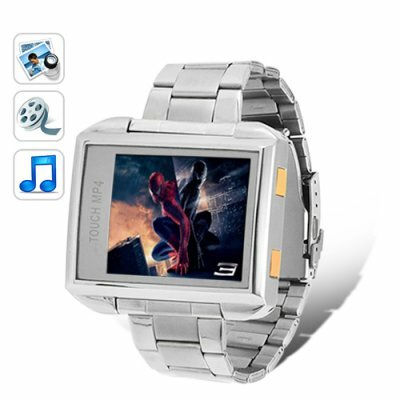 The bottom line: If you're into quality multipurpose gadgets then this MP4 Player Watch in tough guy steel is for you. It's cutting edge wearable electronics with style! Order yours today and we'll ship it out tomorrow. Brought to you by the leader in online direct from China wholesale electronics and dropshipping - Chinavaison. 1/4 the price of the iPod, but twice the sound! Has built-in watch with time, day, date display! The earphone jack is also used as the charging jack. This watch allows you to view JPEG photos while music is playing. For best results, add some soothing Enya type music and load up your watch with some forests or beach scenes and then chill the max out! To unlock the watch, keep your finger on either one of the two volume buttons. Does this watch play AVI files? Yes, simply convert your AVI video file into MTV format with the software included on disk. The software will reformat your original video so that the resolution, frames per second, and size are ideal for this MP4 Player Watch. How many MP3 files can I store in this watch? Well here's the math. This watch has 4GB internal memory. Your average MP3 file is 5MB. That's 2000 MP3 files!